Greenland's ice sheet is becoming smaller and smaller. The melting takes place with increased strength and at a speed that no models have previously predicted. Today, in the esteemed journal Scientific Reports, researchers from the Arctic Research Centre, Aarhus University, and the Greenland Institute of Natural Resources present results that, for the first time, show that the deep bottom water of the north-eastern Greenland fjords is being warmed up by heat gradually lost from the Earth's interior. And the researchers point out that this heat loss triggers the sliding of glaciers from the ice sheet towards the sea. 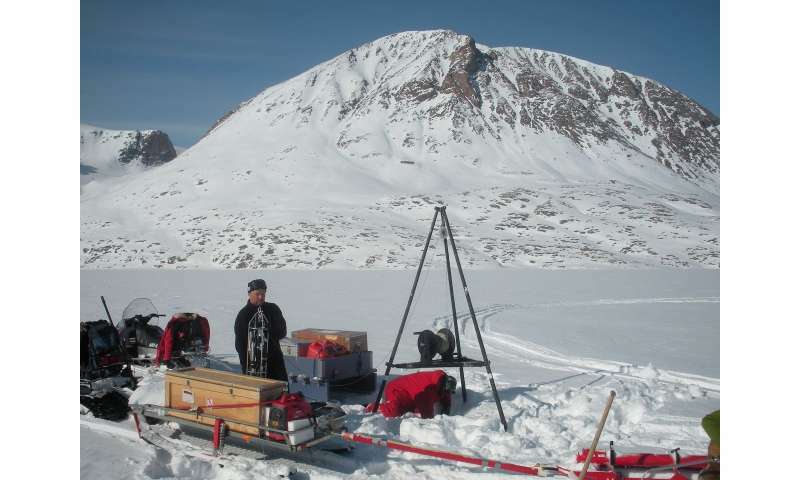 "North-East Greenland has several hot springs where the water becomes up to 60 degrees warm and, like Iceland, the area has abundant underground geothermal activity," explains Professor Soren Rysgaard, who headed the investigations. For more than ten years, the researchers have measured the temperature and salinity in the fjord Young Sound, located at Daneborg, north of Scoresbysund, which has many hot springs, and south of the glacier Nioghalvfjerdsfjorden, which melts rapidly and is connected to the North-East Greenland Ice Stream (NEGIS). By focusing on an isolated basin in the fjord with a depth range between 200 and 340 m, the researchers have measured how the deep water is heated over a ten-year period. Based on the extensive data, researchers have estimated that the loss of heat from the Earth's interior to the fjord is about 100 MW m-2. This corresponds to a 2 megawatt wind turbine sending electricity to a large heater at the bottom of the fjord all year round. 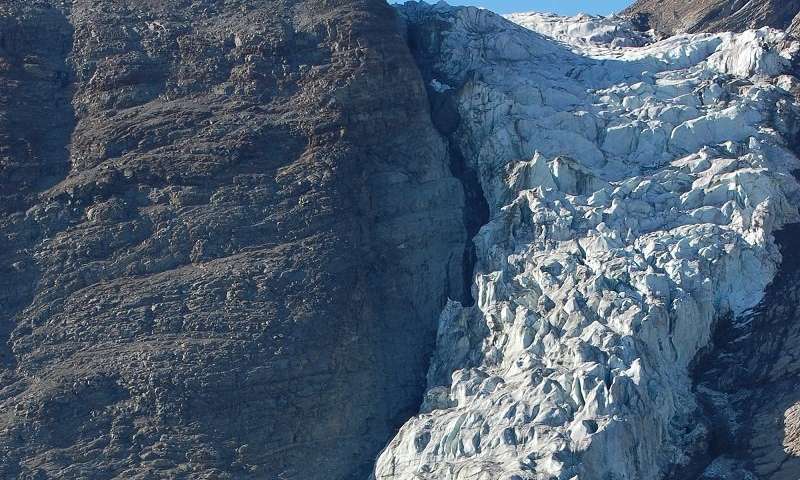 It is not easy to measure the geothermal heat flux—heat emanating from the Earth's interior—below a glacier, but within the area there are several large glaciers connected directly to the ice sheet. If the Earth releases heat to a fjord, heat also seeps up to the bottom part of the glaciers. This means that the glaciers melt from below and thus slide more easily over the terrain on which they sit when moving to the sea. 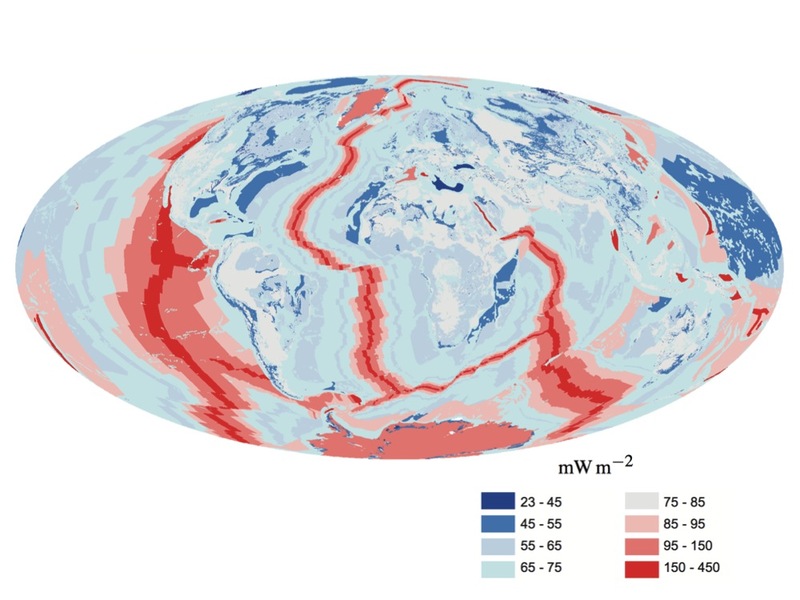 "It is a combination of higher temperatures in the air and the sea, precipitation from above, local dynamics of the ice sheet and heat loss from the Earth's interior that determines the mass loss from the Greenland ice sheet," explains Soren Rysgaard. "There is no doubt that the heat from the Earth's interior affects the movement of the ice, and we expect that a similar heat seepage takes place below a major part of the ice cap in the north-eastern corner of Greenland," says Soren Rysgaard. 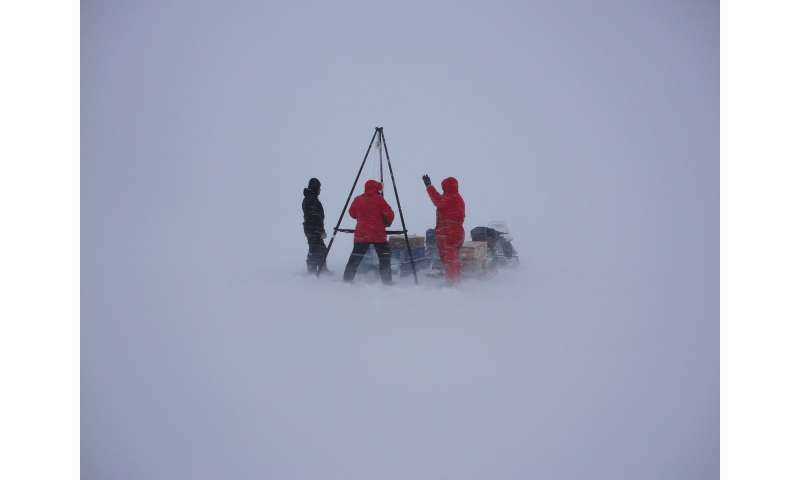 The researchers expect that the new discoveries will improve the models of ice sheet dynamics, allowing better predictions of the stability of the Greenland ice sheet, its melting and the resulting global water rise. What a shame, Greenland's #1 tourist attraction is melting away leaving the land to it's original state of becoming green once again. We await with baited breathe for the return of marauding Viking longboats & their earth-turning hand plows to once again start planting wheat & destroying the once pristine glacial environment. So if this water is being warmed by heat from within the earth just what can humans do about that warming if any thing? If humans cannot do any thing about that warming is it caused by humans? And if this warming is a product of non human activity is there global warming that is caused by humans or is that also a natural event? Your understanding of Greenland , and Vikings needs work. As barakn has pointed out so well below. To his comments I would add that most Viking settlements were the work of the world's first real estate developers. They were trying to get people to move to their new settlements. In this case, a place called "Iceland" . So like all developers ever since, your new name for your new subdivision has to have a cherry name. It's not an either or proposition. That is , "black ice causes wrecks, therefore all wrecks are caused by black ice." More like a stack of pancakes. And the greatest melting is in the Southwest not where this study was done. Hi Benni, I hope you and yours are well; and ready to be more objective, better informed, re Global Climate Change factors/consequences. - Increased heat in climate dynamics draws more extreme/devastating 'Arctic blasts'. @ Really-Skippy. How you are Cher? I am fine and dandy, thanks for asking. Psst, Skippy, England is not WITHIN the Arctic Circle. Other than that you might have a pretty good theory going. Err, nope. Just checked my location, and I'm ~50 N. Admittedly, Scotland is further north, but nowhere near 66.5 N! I presume the heat loss should be in milli-watt /sq m- mW m-2 not MW m-2. Also, it shouldn't be called "heat loss" because at no point should anyone expect for the molten core to not cool over time. Its not that the term is inaccurate, because the core is indeed losing heat, but that it creates this "frame" of thinking. Finally, we know that there is a lot of volcanic activity in the region, so it should go without saying and this is confirming assumptions rather than some revelation. In other words, there literal volcanoes under the ice! @Uncle Ira, @jonesdave and Benni. One wonders how long Benni thinks it takes for a glacier to form. That alone proves his point fallacious.